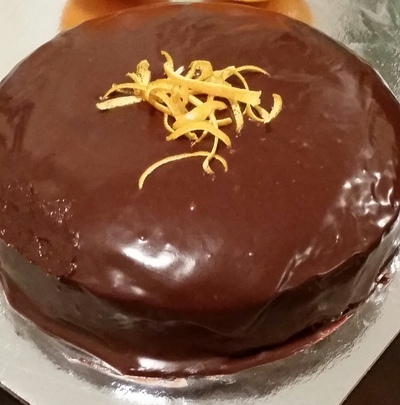 A gorgeous chocolate mud cake with an orange twist. 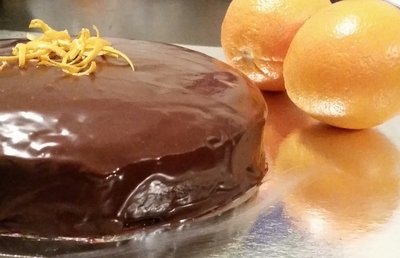 A dense, moist cake with the addition of orange gives it a jaffa flavour topped with a smooth chocolate ganache. Easy to prepare and is sure to impress any guest. Absolutely divine! In a large saucepan, combine butter, chocolate, sugar, water and coffee and orange juice. Stir over a low heat until chocolate/butter have melted. Remove from heat and allow to cool to room temperature. In a large bowl, sift together both flours and cocoa powder and add the orange zest. Gently add in the liquid mixture and fold until combined. Add eggs and again fold gently until all combined. The mixture will be quite runny. Pour mixture in to prepared tin and bake for 90 minutes. NOTE: All oven times vary, so it is important to check on your cake. Cake is done when a skewer inserted comes out with a few crumbs attached. Some cakes might be less or more time in the oven. and sometimes mine has taken 1 3/4 hrs while other times it has taken 80-90 minutes. LEAVE CAKE TO COOL IN TIN!! very important for mud cakes as the mixture starts to crumble if taken out too early. To make syrup, combine all ingredients in a saucepan and bring to the boil. Stir until the sugar has dissolved. Remove from heat and allow to cool to room temperature. To make ganache, heat the cream in a small saucepan until boiling. Break up your chocolate and place in a bowl. Pour boiling cream over chocolate and allow to sit for one minute before stirring quickly to combine. If the chocolate doesn't melt you can return it to a low heat and gently mix until melted or zap in the microwave for 5 second intervals, mixing inbetween until melted. Allow to cool to room temperature to allow the ganache to thicken or alternatively put in the fridge for 20 minutes to thicken. Once cooled, remove cake from tin and brush over cooled syrup liberally. Spread over ganache until nice and smooth. Top the cake with some peeled orange zest for decoration and enjoy!